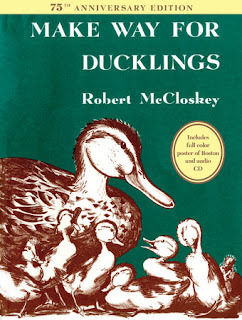 Robert McCloskey's Make Way For Ducklings is perhaps one of the most beloved children's book. The new 75th Anniversary Edition is a beautiful hard back book with dust jacket. It fits inside a larger sleeve. Included is a color poster and audio CD. This is truly a beautiful set. As homeschoolers we've read this book several times and it is included in many of the popular curricula. The story is wonderfully illustrated. The story follows a sweet duck family during their life in the city - including a trip across a busy street to the Public Garden.. The story is sweet and it is a must read! One lucky reader will win a copy of Make Way For Ducklings! I haven't read "Make Way for Ducklings" since I was a little girl! No, I've never read Make Way For Ducklings before. Looks cute though. An enthusiastic yes! I gave Make Way For Ducklings to my duck-loving godson, who loved, loved, loved to have it read to him. no we haven;t got to read this book yet...but would love to ..
As a former kindergarten teacher and as a mom I have read this book many times. I'd love to share it with my nieces. Yes, we've read it! It's a Five in a Row book that we've enjoyed! I have not read this book. I would love to read it to my grandson! I have read it to my children and class several times. No, I haven't read the book but would love to read it to my grandson!